After hanging out and getting some writing done at the Caltech turtle ponds, I was getting hungry. I remembered passing by this burger stand several times in Pasadena called “Bobby’s Place.” There is always a line there so it tells me it has got to be good. So I checked it out on Yelp and it had some decent reviews. I was sold. I headed over to Bobby’s Place and parked in the small left to the East of the Burger stand. The Burger Stand itself is not very enticing. It has an old school, badly in need of a paint job look to it. There were several people in line ahead of me so I had a chance to check out the menu. I eventually opted for the Cheeseburger Combo. It took awhile for my freshly cooked burger but I didn’t mind. I bought a paper and sat down at one of the patio table to the west of the burger stand. 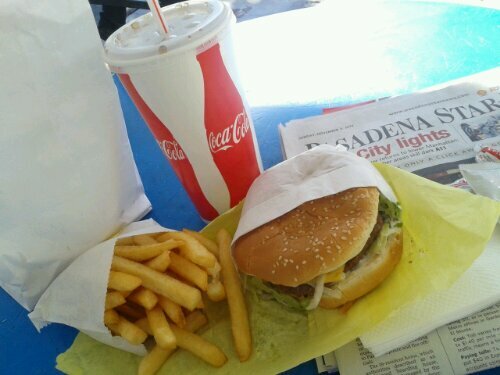 When I finally got my burger, I decided I would hang out and eat my meal there. I have this theory that burgers are best when they are hot and fresh. It wouldn’t be the same if I waited to drive home. So I sat down, cleaned off the table as best as I could (the tables did need a good wiping down), and made sure I took a picture of my food before taking my first bite (I spend way too much time with teenagers who have me hooked on Instagram). Now, this wasn’t a Hook Burger by any means but this was one pretty tasty cheeseburger combo. I am so glad I stayed to eat it there because it probably would not have been as appealing if it was cold and needed reheating. This is definitely a burger that is best when it freshly made. And the prices were very reasonable for a Cheeseburger combo that included a large amount of fries and a drink. I would recommend Bobby’s Place to anyone in the area who is looking for something more than a fast food burger but doesn’t want to pay the prices of a Umami or Hook Burger type of burger joint. I would say that Bobby’s Place is similar to The Habit but is a Mom & Pop establishment so it helps support the local economy. So thumbs up to Bobby’s Place.